No matter the fancy features in many of the modern power juicers, one thing still remains true to this day – food juicers are designed to extract as much juice as possible from fruits and vegetables and even wheatgrass. All other functions are just secondary in nature. Simply put, a centrifugal juice machine works through the action of a spinning basket that chops and grates the fruits and vegetabl es. This process releases the juice, which is then passed through the tiny holes of the basket walls while the pulp remains inside the basket. Think of a tornado and you will get the idea. 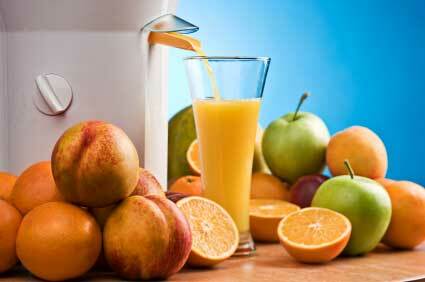 The main advantage of a centrifugal juicer is its quick preparation time. You just need to make sure that the fruits and vegetables will fit into the relatively wide-mouthed chute. Add in the fact that most centrifugal models are affordable than many masticating juicers and you will want the former. However, take note of the demerits of centrifugal juice machines as these can be substantial, too. You will discover that juices have lesser shelf life because of too much heat and air introduced while using it, not to mention that this type of juicer has lesser efficiency. You may not also like it that the centrifugal juicer can be noisy. Plus, it cannot juice leafy greens and wheatgrass so many of your favorite sources of nutrients are immediately excluded from your juice cocktails. Masticating juice machines cut and chew the ingredients while the pulp is expelled at the end of the juicer. Since the extraction speed in on a slow mode, the resultant juice has a longer shelf life with little loss of nutritional value. Just bottle up the juice and store in the refrigerator and it will be just as good the next day. You can use this type for a variety of ingredients including wheatgrass. Plus, you can make smoothies, salsas, purees and peanut butter as well as noodles and pastas with a single change in accessories. You may not like it, however, that the extraction process is sufficiently slow to get in the way of your busy life. And since you have to chop the ingredients into smaller pieces, convenience may not exactly be its strong suit. There are sub-types to the masticating juicers – single auger and single cutter. This is generally considered the best juicer simply because the quality of the juice is the best in both nutrient content and premium taste. Since more juice is extracted, you will be able to get more out of a single piece of fruit than is possible with the other two types. Unfortunately, twin gear power juice machines are very slow, extraction-wise. You will also take a longer time to feed and clean the device. And do remember that citrus and other soft fruits do not take too well the twin gear juicer. Again, it depends on what you need and want from your juicer. Pick the type that best fits your juicing needs best! Twin Gear Juicers – Worth the Big Price Tag? Hand Juicer vs. Electric Juicer: Which is the Best Juicer for You?